Paris, France - May 3, 2018 – Bentley Systems, Inc., a leading global provider of comprehensive software solutions for advancing infrastructure, announced today that it is relocating its French offices to Paris in April 2018. 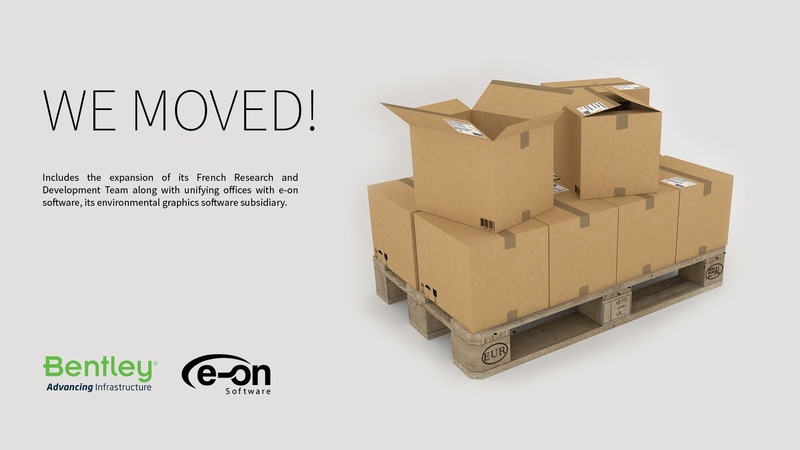 This will accommodate the expansion of its French research and development team, and consolidates office space with its 3D natural environment graphics software subsidiary, e-on software. The new office space both increases Bentley’s footprint in France and supports the company’s growth strategy. “The decision to expand our presence in Paris is a logical step in our software development strategy,” said Francois Valois, Portfolio Management Vice President. “The office environment complements our agile development process as we continuously work to enhance our Bentley solutions with the goal of adding new features and benefits for our Bentley’s users." “Art & co” building, an ART DECO building, on 15 - 17 rue Traversière, Paris 12e was originally built in the 1930s (historically SNCF buildings, French Railways Networks), and now it has been extended and refurbished by CALQ Studio, led by Arq. Jean-Philippe Le Boeuf. It is very centrally located and enables employees to easily commute. The new Bentley office in Gare de Lyon will be relocating employees to a modern-looking office with an open floor plan, and multiple meeting rooms. It can comfortably house up to approximately 60 employees in the future. It will have a large room equipped with the latest generation hardware and software to have a larger venue for meetings, product demonstrations and events. It will be also used by service and hardware partners to further educate our users and prospect users.